If you are having a bronchoscopy, follow your health care provider's instructions on how to prepare for the procedure. There are no risks with this test, unless bronchoscopy is performed. 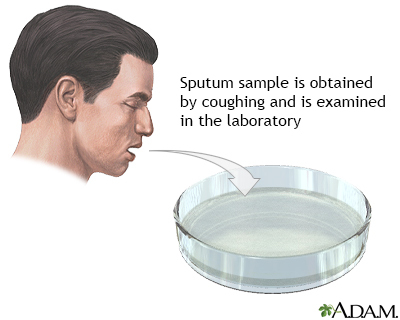 A sputum sample is obtained by coughing deeply and expelling the material that comes from the lungs into a sterile cup. The sample is taken to a labarotory and placed in a medium under conditions that allow the organisms to grow. A positive culture may identify disease-producing organisms that may help diagnose bronchitis, tuberculosis, a lung abscess, or pneumonia.